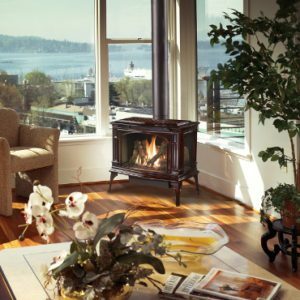 The Greenfield™ cast iron gas stove is a true revolution in stove design. Combining clean lines, graceful proportionality and traditional cast appeal, this stove can be considered a freestanding fireplace! The number-one feature of the Greenfield is its massive 553 square inches of fire-viewing ceramic glass, which comes standard with 2015 ANSI approved invisible safety screens. The three-sided wrap around glass design allows you to enjoy the stunning fire display from any angle in the room, which showcases the award winning Ember-Fyre™ burner with its incredibly realistic, high-definition log set and yellow flames. Another amazing feature of the Greenfield is its downward pointing adjustable accent light which beautifully highlights the log set and interior of the stove, whether is heat is on or off.